Do princesses play with gadgets and gears? Some of them grow up to be engineers! 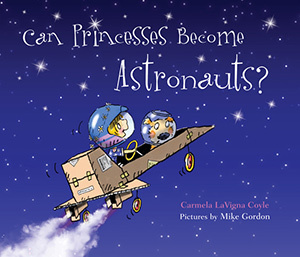 The universe is a big, BIG place filled with endless possibilities for an everyday princess. Dream along as a little girl and her family imagine what she might be when she grows up. A chef? An astronaut? A flower fairy?? One thing is for certain, not even the sky is the limit when you believe in yourself. Blast-off!